An artist with a broad range of talents to match her uncommon catholicity of tastes, Thea Farhadian is known as a gifted composer and improvisor not only in the two cities that serve as the bases of her operations - San Francisco and Berlin - but in cultural hubs as far flung as New York (performances and presentations at Columbia University; the Issue Project Room; Alternative Museum), Amsterdam (Bimhuis); and Edinburgh (Sound & Anthropology Conference, University of St. Andrews). 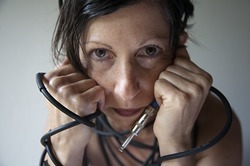 She has also founded BlackCopper Editions, a new record label for improvised and experimental music. Her interest in Near Eastern music and cross cultural issues led Ms. Farhadian to study violin and classical Arabic music with Simon Shaheen. Her involvement with the music and the artists of the Near and Middle East blossomed into an enthusiastic lifelong exploration of cultures throughout the region. Her radio art project Voices From Behind the Veil was premiered first at the University of Montana, then in Switzerland and in other European countries. She eventually turned her attention to Armenia, her grandparents’ point of origin. She co-founded the Armenian Film Festival in New York City and later co-curated the Festival when it was brought to San Francisco. To her busy agenda as a composer, improvisor and cultural critic Thea Farhadian adds the role of educator. She has taught violin for a quarter century, but has employed the university context (University of California at Santa Cruz) to delve into broader cultural questions including how 20th and 21st century art, conceptual art, performance art, web-based works, early feminist art, body art, and Middle Eastern art address such issues as identity, race, and representation. She has conducted residencies at Studio for Electro-Instrumental Music (STEIM) in the Netherlands, at Bait Makan in Jordan, and at the Montalvo Arts Center in Saratoga, California. Thea Farhadian was born in Oakland, California and began playing the violin at age 6. Later in life, Ms. Farhadian was inspired at Mills College by electronic music composer Maggi Payne to find the interplay between technical refinement in electronics and excellence, experimentation, and compositional intent. Other teachers of note were Eugenia Newman, John Bischoff, Chris Brown and Fred Frith. When in California, she studies with Gerard Svazlian. She earned a Bachelor’s degree in Philosophy at the University of California at Santa Barbara, an M.A. in Interdisciplinary Arts from San Francisco State and an M.F.A. in Electronic Music from Mills College. For 10 years she was a member of the innovative Berkeley Symphony under conductor Kent Nagano. She lives in and divides her time between the San Francisco Bay Area and Berlin.